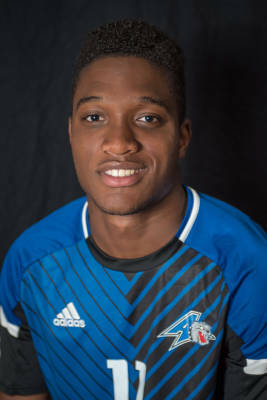 Chuka Anyafor is the new forward for the men’s soccer team. Starting at a young age Chuka Anyafo, a native of Charlotte, felt a connection to soccer. Through his father who played professionally for the Nigerian team and also playing for school teams emerged a love for the international sport. The 21-year-old economics student said the sport became an important part of his life. From starting with the Charlotte United Futbol Club in middle school, to the North American Academy in high school, now known as the Carolina Rapids, Anyafo continues to make great memories playing the sport. Over the summer, the transfer from Lafayette College played for a National Premier Soccer League in Virginia Beach, Virginia. Only in the beginning stages of its existence, Virginia Beach City FC traveled all over the D.C., Maryland and Virginia area to play other teams in their region. Anyafo said traveling with Virginia Beach City FC was an exciting experience that gave him the opportunity to travel with an up and coming club. Traveling is a large priority in Chuka’s life. He said he wants to sign a professional soccer contract after finishing his studies at UNCA. Anyafo said he played in exciting games throughout the world. He went to tournaments in Spain and France, giving him just a taste of what an international soccer career could entail. Coming back to Asheville and starting the season brings excitement to the young forward. He sees a lot of potential within the team because of last year’s win over Coastal Carolina University and the fact they gave Winthrop University somewhat of a scare last season. Both Coastal and Winthrop were power teams in the 2015-2016 season of the Big South Conference. Winthrop being the reigning conference champions and Coastal finding a place at the top of the standings last season. According to an article published on the men’s soccer page, UNCA ranked to finish the season seventh overall. The nine teams in UNCA’s conference are headed by Radford University. Anyafo said he does not pay attention to articles and polls like this one. Don’t belief this message: it would say that foreach legitimate promo code you enter.